Eva was a great sleeper and a perfect little newborn model. We started in a crate, where she got the honour of trying out this new autumnal headband, which had just arrived. Together with an orange wrap, I think it sets a lovely, cosy, autumnal scene. From there is was onto a fluffy rug and time to expose those little feet. Most babies sleep so well when wrapped up snug. There are always the exception but Eva seemed to enjoy being so cosy. 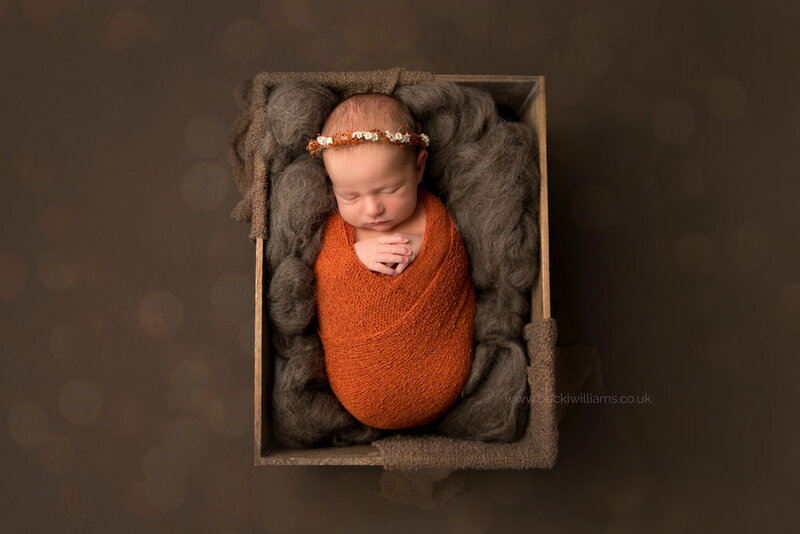 Eva let me move her from her side, onto her tummy and then onto her back while using a variety of wraps and blankets to make sure her mum and dad had a lovely variety of images to choose from. Check out those lips - SO cute! This white, furry blanket is such a lovely way to finish off a newborn photo shoot. If a baby is awake, it’s a lovely backdrop for some natural images. If they stay asleep, it’s just so simple and ‘unfussy’ (that’s a word, right?) and leaves all the focus on your new baby. Eva stayed fast sleep and just look at her - she looks so peaceful and beautiful! Big brother Oliver arrived home from nursery just in time for a picture with his little sister. Hopefully this is one they can treasure when they’re all grown up. I love going back to photograph families I’ve met before, whether that’s for shoots over their baby’s first year or little siblings, just like Eva. More and more clients are becoming more like friends as I watch their little families grow, which makes me so happy!